Autonomous Farm Equipment Market size was valued at over USD 55 billion in 2016 and its demand is projected to cross 3 million units by 2024. Increasing labour shortage along with shifting trends towards usage of autonomous equipment are among the key factors driving the autonomous farm equipment market size from 2017 to 2024. Development of autosteering systems in tractors offering higher productivity will further boost the business growth. Growth in start-ups focusing majorly on the implementation of robotics in agriculture owing to increasing productivity and reduction in operation cost. Huge adoption of farm machinery guidance systems in tractors, UAV and harvesters will primarily drive the industry growth. Industry players are constantly focusing on increasing the penetration of tractors with autosteering applications. Farmers and contractors are constantly focusing on cost-effective solution and increase the agricultural yield. Application of GPS systems along with development of IoT has revolutionized the agriculture industry. High cost required for the product may affect the product penetration. Moreover, additional training required for the usage of the product may act as challenge to the industry demand. Industry players are focusing on reducing the overall cost making it affordable and thus increasing the product penetration. Fully autonomous will depict a strong growth at over 40% up to 2024 in the next seven years. Implementation of precision farming system offering the vehicle to drive on its own avoiding obstacles and other vehicles without supervision of the driver will boost the autonomous farm equipment market demand. Partially autonomous contribute the major volume share of the industry owing to implementation of the systems at competitive prices and commercialization of the products. In addition, increasing awareness of the product particularly in emerging countries for various agricultural processes will support the business demand. Tractors capture the major revenue share and is expected to continue its dominance over the forecast timeline owing to its wide usage in agricultural sector. Constant operating capability of these vehicles with higher ROI factors will positively influence the autonomous farm equipment market penetration. Harvesters will showcase significant growth over the coming years. Continuous development in robotics along with availability of the product at competitive price are the key factor for industry growth. In addition, guidance systems in the harvesters used for automatic steering offering superior performance using optimal path and reducing the risk of overlap are highly preferred by the customers. UAV is anticipated to witness robust growth at over 35% up to 2024. Usage of drones for the hazardous works such as fertilizer and pesticides spraying will propel the business demand. Moreover, new entrants are offering competitive priced products with superior performance and higher load carrying capacity. Industry players are focusing on reducing the overall cost of the software and improving the compatibility with the equipment. Moreover, continuous development in the software boosting the precision of the product will further support the autonomous farm equipment industry growth. 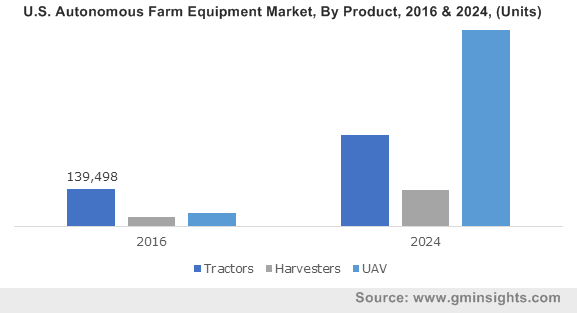 Hardware dominates the overall autonomous farm equipment market revenue share, accounting around 95% owing to increasing advancement of the product. In addition, easy operation of the device for various agricultural process requiring higher capacity will positively influence the product penetration. North America dominates the autonomous farm equipment market accounting over USD 26 billion in 2016. The high revenue generation can be attributed to presence of various industry players across the region. High usage of the tractors and combine harvesters with autosteering capabilities in the country will further enhance the industry growth. Europe led by Germany, Italy, France and Russia will show significant growth at around 20% during the forecast timeframe. Cost effective solution offered which in turn improves the productivity will fuel the industry demand. Asia Pacific led by China, Japan, South Korea and Australia is poised to grow at over 25% up to 2024. Expanding population will require smart efficient devices offering higher productivity and minimizing the wastage sufficing the growing food demand. In addition to this, government plans implementing advanced solutions offering higher accuracy and precise operations will further boost the product penetration. John Deere, Case IH, AGCO, Agribotix, Agricultural Solutions Ltd, Agrobot, Autonomous Tractor Corporation, Harvest Automation, Mahindra, CLAAS, DEUTZ-FAHR are among the major manufacturers included in the value chain of the component and the service of autonomous farm equipment market. Merger and acquisitions are among the major strategies implemented by the manufactures to establish superior foot hold in the industry. For instance, in September 2017, Deere and Company acquired Blue River Technology increasing the product portfolio and implementing precise technologies driving the autonomous farm equipment market demand. Autonomous farm equipment penetration is boosting owing to shifting consumer preference towards higher yield and cost-effective solutions. In addition to this, the product offers less downtime as these can be used during night and under higher fog condition. Autonomous farm equipment offers superior fuel efficiency as compared to conventional counterparts with reduced chances of errors. Increasing climate changes and challenges such as water shortage are easily addressed by the usage of these devices.